It's St. Patrick's Day so we are supposed to be eating corned beef, drinking green beer, and pretending to be Irish even if we don't have an ounce of Celtic heritage in our DNA, right? 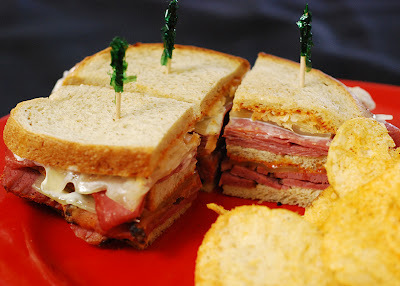 When I think of corned beef I can't help but remember European Street Cafe in Jacksonville, FL and their huge deli sandwiches. Stacked with piles of meat and accompaniments, their double and triple decker sandwiches were as delicious as they were tall. 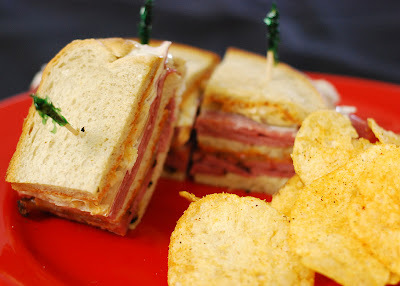 One of my favorites was the Blue Max, a variation of the Rueben. It was piled high on rye bread with smoked pastrami, hot mustard, corned beef, melted swiss, sauerkraut, and blue cheese dressing. To cut the salt content, I soaked it in a bin of water for half a day. I kept it refrigerated and swapped out the water every 4 hours. I smoked it in the Big Green Egg using cherry wood and coal. I went a little higher temp of 275f until it reached an internal temp of 165f. 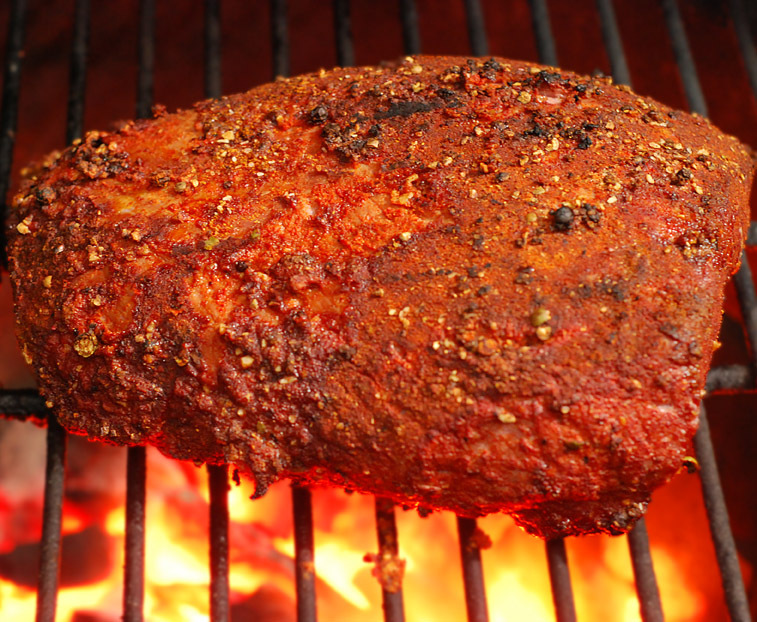 You could do the same thing on your grill if you set it up for indirect cooking and add wood chips, chunks or "smoke bombs" (wood chips in foil packs). 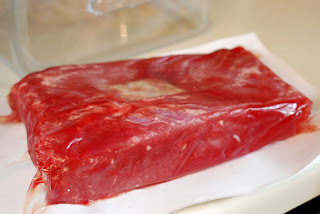 Lining your drip pan with foil makes for easy clean up. Then I switched to direct heat, opened up the vents to increase the temperature and did a reverse sear to get a darker color. It only took a few minutes per side to accomplish that. I put it in the fridge until I was ready to use it and then steamed it to warm back up. This is a trick I picked up over at the BBQ Addicts. 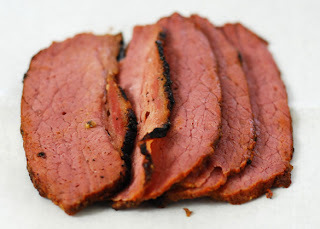 They say it makes a more moist and tender pastrami like the NY delicatessens do. 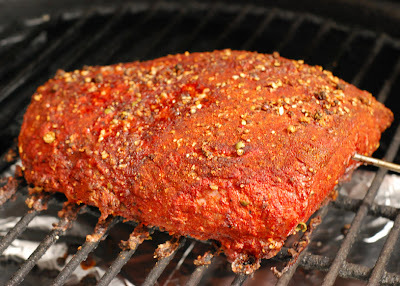 I ended up steaming mine about 1 hour and 15 minutes to get it up to an internal temp of 190f. Sliced nice and thin, it is hard not to eat it all right then and there. 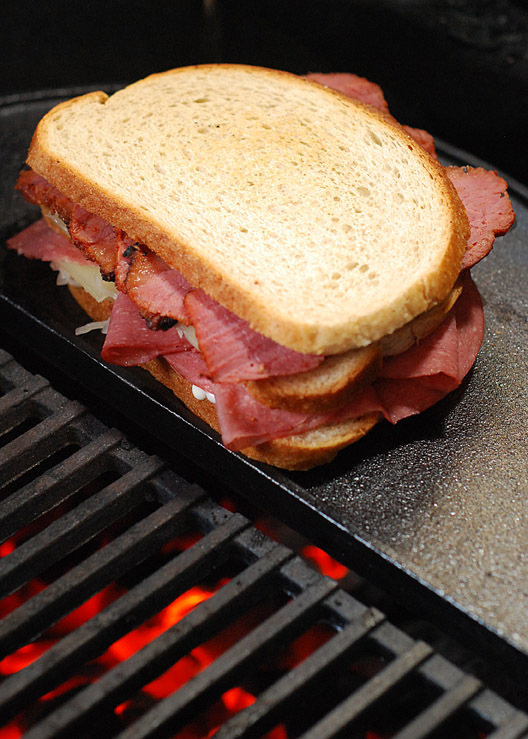 Top one slice of bread with the pastrami, one piece of cheese, and another piece of bread. Heat with the cheese side down on a hot griddle for 2 minutes. You are trying to crisp what will be the center piece of bread and melt the cheese here. Remove from griddle. Put back on a plate with the toasted piece of bread facing up. Slather it with the sweet hot mustard. Top with the corned beef, sauerkraut, blue cheese dressing, the other piece of cheese and the last piece of bread. Place on a hot griddle for two minutes. Flip and toast the other side for 2 minutes. You could use a flat top griddle inside, but tonight I used my griddle insert for my Craycort cast iron grill grate system. I figured that the pastrami was cooked with live fire so the sandwich might as well be grilled that way! Quarter the sandwich and serve with chips. Unhinge your jaw and eat it like a snake. One quarter was missing for uh....quality control, yeah, that's it. Now if only I had one of European Street Cafe's two hundred beer brands to wash it down! Speaking of brisket, here are a few tips for smoking brisket that I learned from Chris Lilly at Kingsford University this month. He cooks competition briskets to a higher temp (200f) because he is only concerned about getting one part of the brisket to the right temp. But when cooking for friends and family, he pulls 185-190f because it gets the whole brisket done better. Chris doesn't separate the point for burnt ends until after the whole brisket rests for an hour after the initial cook. Chris doesn't inject his brisket. Three words: Worchestershire sauce powder. I have to find this stuff. Robyn of Grill Grrrl carries a thermapen in her purse. A pink one. 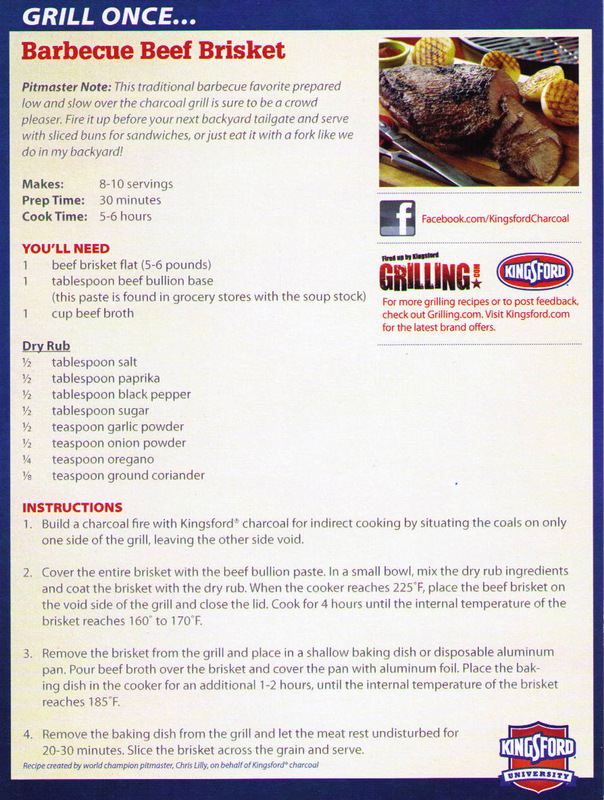 And here is one of his recipes for barbecue beef brisket courtesy of Kingsford Charcoal and Chris Lilly.